The latest phase of the high-speed rail link between London and mainland Europe is the re-purposing and renovation of St Pancras station. The first phase of a 2 billion euro improvement programme kicked off in 2006 with an investment of more than 1.2 billion euros to radically improve the passenger experience at the airport. The Heathrow Express is the fastest, most frequent way to travel between Heathrow Airport and central London. The Hungarian nation is repaying a 150-year-old debt with the opening of the Palace of Arts . This institution, which is unique in Central Europe , opened its doors on 14th March 2005. In 2000 a new Gemini family entertainment centre was opened in Gdynia, Poland. The entertainment center has 12,000 square meters of space and includes a multiplex cinema operated by Silver Screen. 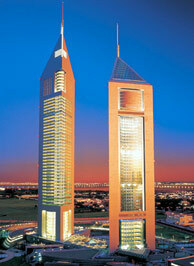 On Sheikh Zayed Road is one of Dubai's most prestigious construction projects ever, the Emirates Twin Towers. Consisting of a 356m high office tower with a gross floor area of 68,000sq.m and an adjacent 306m high 400 room hotel, it is a unique architectural icon of Dubai. With the language of the architecture being intentionally corporate and inspired by traditional Islamic themes, the design concentrates the buildings away from the highway in a central portion of the site. To be the most exceptional, to be regarded as the ultimate and to provide the definitive hotel experience - these goals form the foundation of Burj Al Arab.